More states are suing the Trump administration to dissolve a settlement it reached with a company that wants to post instructions online for making 3D-printed firearms that are hard to trace and detect. Mostly Democratic attorneys general from 19 states, plus the District of Columbia, filed an amended complaint Friday asking a judge make it illegal to share plans on creating printable plastic weapons. One Republican—Colorado's attorney general—joined the lawsuit. It comes days after U.S. District Judge Robert Lasnik blocked the plans from being released until Aug. 28. He has scheduled an Aug. 21 hearing on the states' request to reverse the U.S. State Department's agreement with Austin, Texas-based Defense Distributed. The settlement jeopardizes states' ability to enforce gun laws, including background checks, and puts public safety at risk, the complaint said. The availability of plastic guns threatens safety in prisons and jails and makes air travel more susceptible to terrorist attacks, the states said. "The states and the District of Columbia have a clear and reasonable fear that the proliferation of untraceable, undetectable weapons will enable convicted felons, domestic abusers, the mentally ill, and others who should not have access to firearms to acquire and use them," Lasnik said in his temporary order Tuesday. Defense Distributed owner Cody Wilson, a self-described "crypto-anarchist," has said "governments should live in fear of their citizenry." His company seeks to make guns accessible to everyone, making "meaningful gun regulation impossible," according to the complaint. Wilson's lawyer, Josh Blackman, told The Associated Press on Friday that they are "still considering our options" but did not elaborate. He told the judge this week that the safety risks claimed by the states is "largely exaggerated" because many of the files are already online. Washington state Assistant Attorney General Jeff Rupert acknowledged that some files are out there but hopes the court rulings will make it clear that any new posts violate federal law. A group of gun-rights advocates called the Firearms Policy Coalition responded to the judge's order by creating a website with plans for various firearms, including "the Liberator," a 3D-printable single-shot handgun. "Our Constitution's First Amendment secures the right of all people to engage in truthful speech, including by sharing information contained in books, paintings, and files," the group said in a statement online. "Should any tyrants wish to chill or infringe the rights of the People, we would welcome the opportunity to defend freedom whenever, wherever, and however necessary." Kris Brown, co-president of the Brady Campaign to Prevent Gun Violence, a gun-control advocacy group, said the Firearms Policy Coalition's "reckless and dangerous behavior" isn't a constitutional position but "a publicity stunt that will lead to someone being hurt or killed." Washington state Attorney General Bob Ferguson urged the federal government to enforce the court order prohibiting distribution of downloadable gun files. The expanded lawsuit comes as a group of congressional Democrats introduced legislation that would block online instructions for 3D-printed guns, which are largely undetectable at security checkpoints, according a statement released Friday by U.S. Reps. Ted Deutch and Debbie Wasserman Schultz of Florida, Brad Schneider of Illinois and Carolyn Maloney of New York. "This isn't about freedom of information; this is about our national security and our public safety," Rep. Deutch said. Another measure introduced this week requires plastic guns to have serial numbers and enough metal to make them visible on screening machines. President Donald Trump has questioned whether his administration should have agreed to allow the plans to be posted online, tweeting Tuesday that the idea "doesn't seem to make much sense!" Since then, he has been largely silent on the issue. 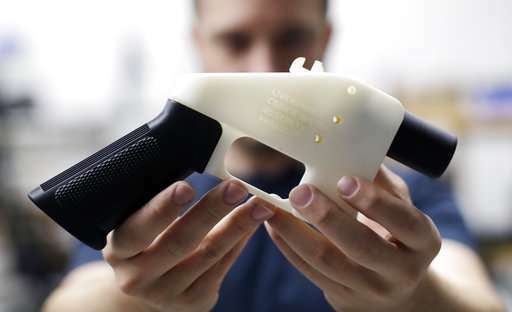 U.S. citizens can now publish models of 3-D printed firearms online. What does it mean for us?